Note from Wendy: When I travel with my kids, an exciting hotel pool is a godsend. The more fun it is for them, the more relaxing it is for me. Adult pools never factored into my hotel decisions…until they started to become a property’s design showpiece and social center. Nowadays hotel pools may offer stunning views from a rooftop, transform into the hottest hangout at night, or be tucked into your own private villa. We know you are doing it. How do we know? Because we are doing it too. It’s normal to scour the Internet in cold weather, warming up mentally by staring at pictures of warm-weather resorts from Santorini to Santiago. Just the sight of a palm tree in sunlight or the razor’s edge of an infinity pool is enough to make us whip out our credit cards in the name of an escape from late winter’s freezing clutches. If you need to get away, these hotels around the globe offer pools that certainly made us drool. Several on this list are budgetary bucket-list experiences (we definitely drooled over the Iniala Beach House), but we’ve also found many that are as affordable as they are beautiful. 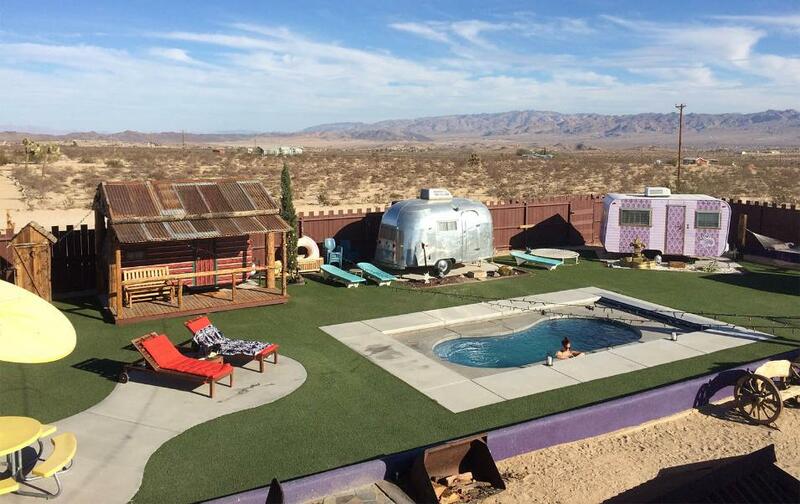 Check out the hippie enclave Hicksville in Joshua Tree, Calif.! And, don’t forget your little ones, because we didn’t. Disney has a pool that kids from 9 to 92 will want to visit in 2015. This family-owned resort (pictured above) is set atop a cliff overlooking Cape Panwa, surrounded by lush foliage, thick groves of trees, and an absurd number of infinity pools. There are 85 on the property! 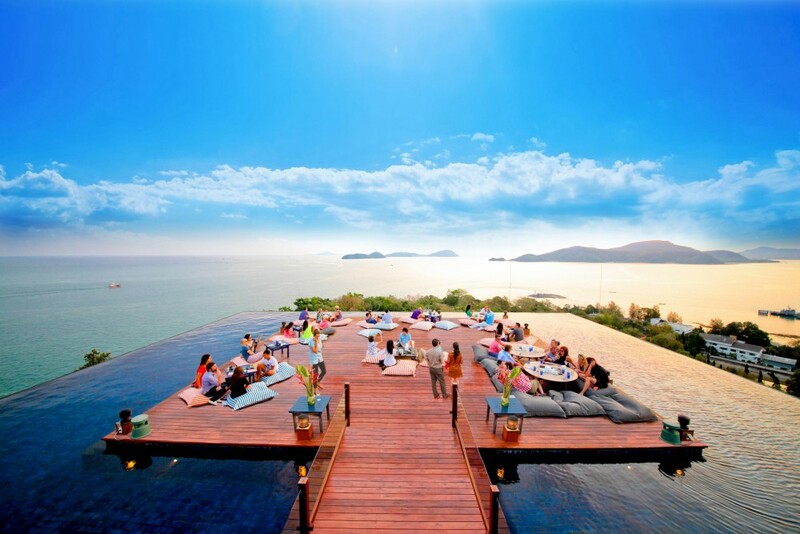 The Baba Nest is the crowning glory, where you can literally swim with the birds and enjoy 360-degree views of the Andaman Sea. Large, fluffy beanbags are set out around 5 p.m. for those who want to enjoy the vista without getting wet, and even if you aren’t staying at Sri Panwa, you can make a reservation for a spot on this roof deck by calling the hotel. Fun Fact: If you want an infinity pool at your disposal 24/7, book a pool villa. As you swim, you get direct views into your master bedroom, which appears to float on a platform over the water. There are more than 75 villas featuring private pools at Sri Panwa, and prices start at $1,000 per night. Courtesy Belmond Hotel Caruso, Ravello, Italy. Set at the highest point above the town of Ravello, this pool is an architectural masterpiece, seemingly suspended in the clouds. Swimming here provides an unparalleled view and breathtaking photo opportunities of the coastline below. 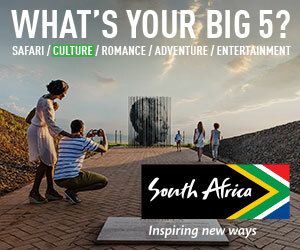 Prices from $500 per night. Fun Fact: The concierge can bring you an iPod pre-loaded with your choice of music and a fresh fruit appetizer. There’s also something called “an Evian vaporizer” for guests. Because when you’re in a pool, you definitely need to mist your face with European bottled water, right? Gazing out at the Last Hope Fjord in Puerto Bories, Chile, there’s no way one can help but feel tiny in the face of such awesome, staggering beauty. 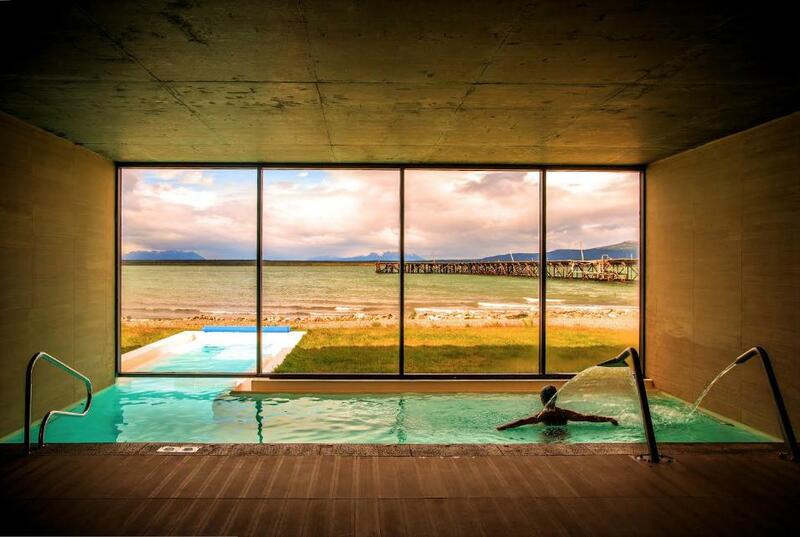 There is only wild, untouched coast and the snowcapped Patagonian mountains in front of you as you soak in this heated indoor/outdoor pool. It’s definitely an “edge of the Earth” moment. Fun Fact: In a former life, the property was a early 20th-century cold storage plant. The owners transformed it into a luxury hotel, but they kept a few of the machines as a quirky, private museum collection inside the hotel. Rooms start at $350 per night. Debuted in August 2014, the hotel’s breathtaking, three-story aerie on the 25th floor features an indoor swimming pool, modern lines, bright blue water, and incredible poolside service. Those aren’t the only amenities you’ll find here. 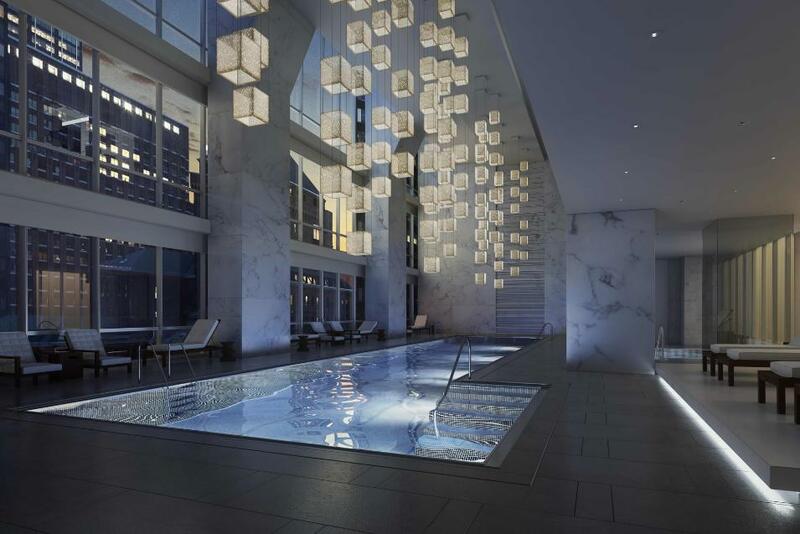 There are underwater speakers built in the pool walls and floor, and the exclusive soundtrack is specially curated by Carnegie Hall for the Hyatt’s pool. How classy is that? Fun Fact: As part of the pool experience, guests can indulge in the hydrotherapy hot tub, decadent steam room, and private changing rooms. The starting price for a night’s stay at the hotel starts at $795, but this is one on the list you can enjoy even in winter. This resort (open since fall 2013) was previously a private home. It was converted to a boutique hotel, offering only three villas and one penthouse. For the rooms and layout, owner Mark Weingard contacted his favorite designers from around the globe. No two rooms are alike. Each villa sleeps six and features a private, unique, infinity pool. Every pool on property faces a pristine stretch of the white sands of Natai Beach and the ocean beyond. Fun Fact: It’s not cheap to carve out an escape here (villas start around $3,500 per day), but the included amenities are insane. 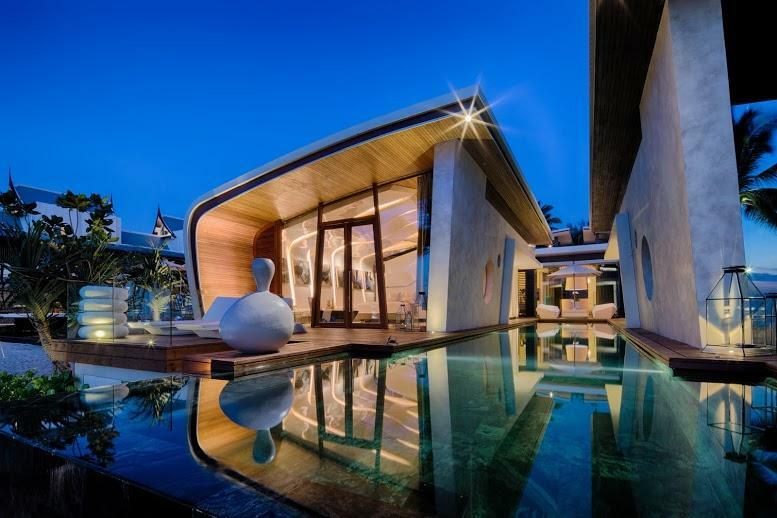 You get daily spa treatments, free activities — like kayaking past herds of water buffalo in Phuket’s estuaries, Muay Thai kickboxing training, and guided mountain bike tours — and dinner at the property’s Michelin-starred restaurant, Aziamendi. Courtesy The Hicksville Trailer Palace, Joshua Tree, Calif. The Hicksville Trailer Palace, Joshua Tree, Calif.
Who wouldn’t want to pull off the highway for Hicksville? This trailer-park motel is a retreat for artists, from filmmakers to musicians, who come for the peace and fun peculiarity of spending a few days in a restored Airstream ($125) that’s powered by solar energy and has fast Wi-Fi for surfing. The pool is a welcoming attraction in the center of the trailers. Tiny, filled with saltwater, peanut-shaped and heated, it’s a one-of-a-kind place to collaborate on your documentary or have an impromptu jam session with total strangers. Fun Fact: The Trailer Palace also offers a BB gun range, table tennis, a fire pit for s’mores, and archery. It’s like summer camp for adults, y’all. 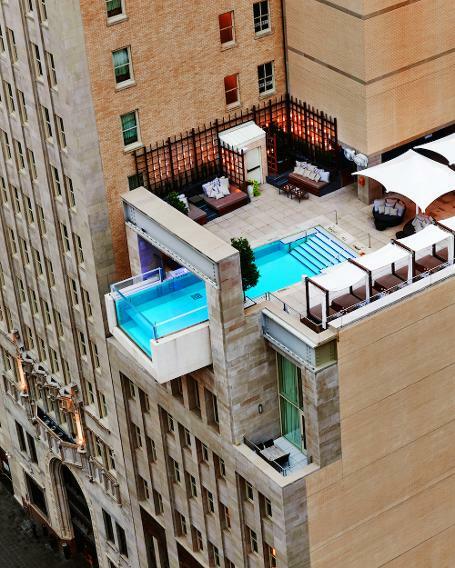 This pool has landed on many a list, thanks to its lofty location. The Dallas-based architecture group Architexas cantilevered it eight feet off the side of a Gothic high-rise building smack in the middle of Downtown. Swimmers can literally backstroke above busy city traffic. Room rates to stay here start at $250 per night. Fun Fact: Valet parking is free here if you arrive in a hybrid vehicle. 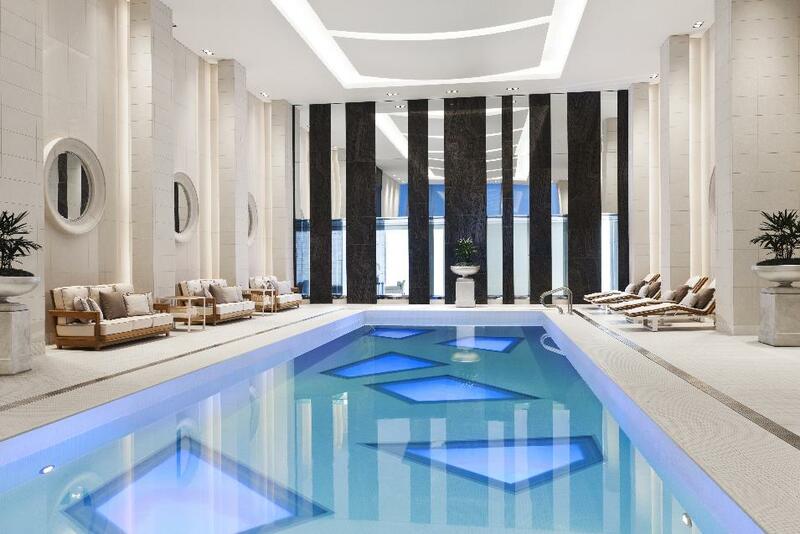 Stretching more than 50 feet and heated to accommodate the fickle Canadian weather, this one doubles as a work of art thanks to classic Art Deco-styled lights in the pool floor. Based on the time of day or mood of the moment, the lights change color, creating a sensory experience for the swimmers. Natural light also streams in from the adjacent, outdoor restaurant, aptly named Reflections. Fun Fact: You can stay at this Forbes five-star property for only $230 per night. If you love the cold but still crave a great pool, check out Canada’s largest indoor option. 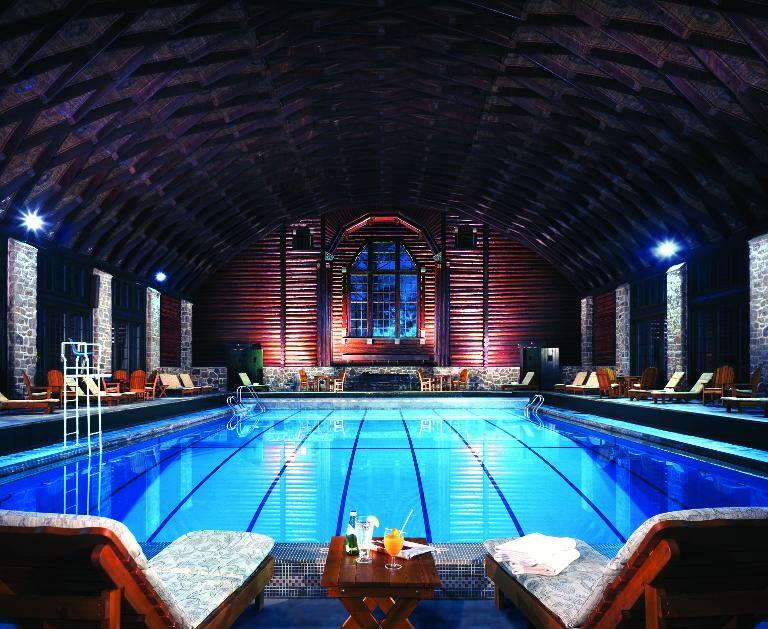 Towering cedar timber surrounds you in this log-cabin-housed, 55-meter lap pool. Fun Fact: Rumor has it that the architects designed this one to be a foot short of the Olympic length on purpose. This assured it would never been used by teams looking to practice and would always retain the peacefulness associated with vacationing in the mountains. Rooms start at $200 a night. Courtesy The Omni Grove Park Inn, Asheville, N.C. The Omni Grove Park Inn, Asheville, N.C. If you can’t afford to stay ($199 per night), it’s no problem. You can still experience one of America’s coolest pools by simply purchasing a day pass to the spa. 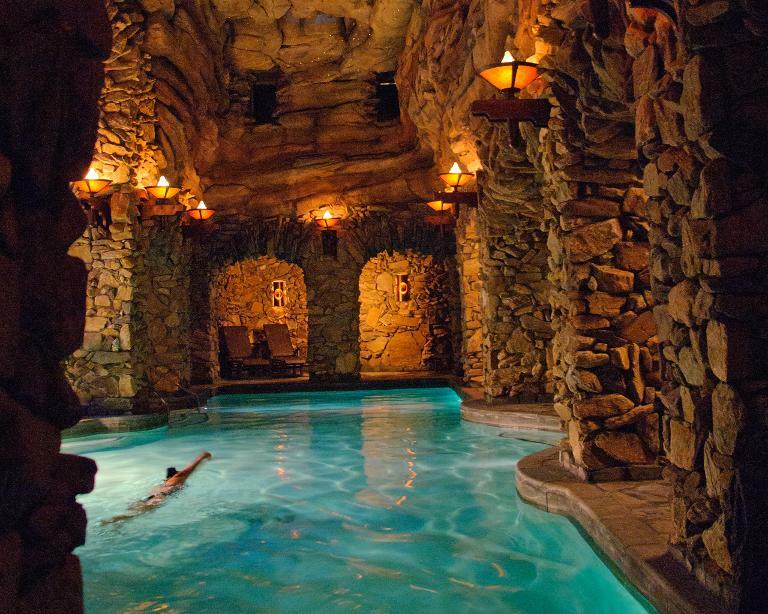 The Grove Park’s swimming chamber is subterranean and encompasses an amazing 43,000 square feet. Built into the natural rock, there are caves, waterfalls, tunnels, rock walls, and arches to explore. It’s a sensory experience full of bouncing shadows and beautiful colored lights. Fun Fact: The Omni Grove Park Inn has hosted many celebrated guests including F. Scott Fitzgerald, Thomas Edison, Henry Ford, Harry Houdini, Will Rogers, Helen Keller, and Eleanor Roosevelt. Courtesy Disney’s Boardwalk Inn Resort, Lake Buena Vista, Fla.
Disney’s Boardwalk Inn Resort, Lake Buena Vista, Fla.
Disney understandably spares no expense or sense of whimsy when it comes to pools. It was tough to pick just one. 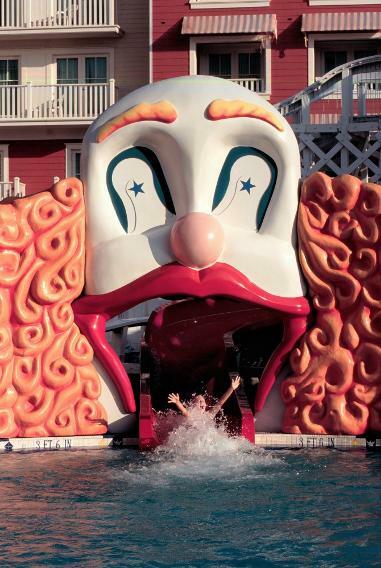 Sliding out of a giant clown’s mouth won us over in the end. The pool features an actual roller-coaster water slide, culminating in the carnival-themed, massive blue pool with a carousel bar and elephant statues that spray you with cold water. Rates are from $381 per night. Fun Fact: At this resort, you can rent surrey bikes that seat two, four, or even six people. Take a cruise down the hotel’s iconic boardwalk. You totally nailed it with the ones I have been to: Singular, Caruso and Park Hyatt NYC. Spectacular!! !